Last week, I had a fascinating conversation with Lacey Haslam of Oakland-based BLOCK Gallery and artist Kari Marboe regarding their newest project titled Latham Memorial Fountain Unveiled. 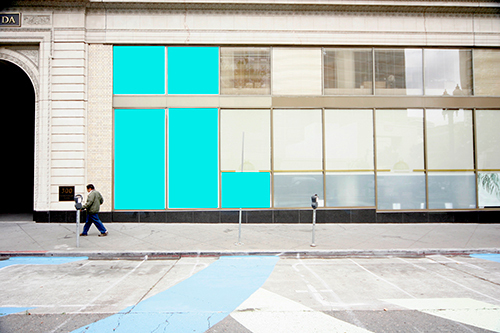 Six months ago, they connected over email and by November, BLOCK will be presenting Kari’s site-specific public artwork in Oakland’s downtown area — specifically on the site known as Latham Square. It wasn’t until half way through our conversation that I realized that we were sitting in Latham Square, just a few feet away from the site-specific building windows that would house Kari’s artwork. Kari shared fascinating stories and trivia tidbits about the small section of the city known as Latham Square, which was named after the late-19th century pioneer family of James and Henrietta, and their children Milton and Edith. The family had fueled money and programming into Oakland, including education for children on animal rights. One hundred years ago, Milton and Edith created a memorial fountain to their parents that was for “both man and beast”. 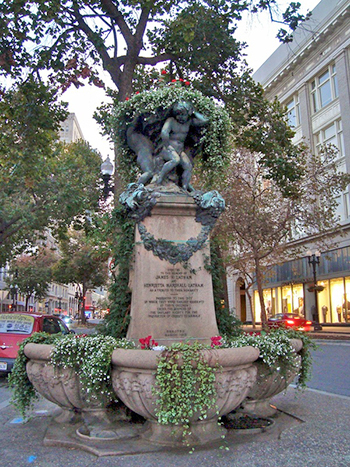 The incredibly historical Latham Fountain now sits in Latham Square – sans running water – as a source of inspiration for Kari’s newest work. 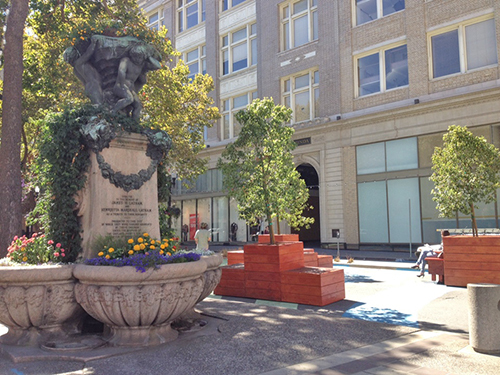 Oakland’s Latham Square Plaza sign blocks car traffic from bisecting the pedestrian plaza. Jeffrey: So what’s BLOCK Gallery all about? Lacey: BLOCK started experimenting in 2010, playing with the on-going question of what happens when we move artwork outside of the white wall gallery space — thinking about the function of art outside traditional institutions, whether that’s museums or galleries. What BLOCK aims to do is tap into the function of art, and activating art from a more inclusive and educational place. What started as an experiment turned into site-specific exhibitions, meaning curating the work based on what’s happening in the space and using the context of the space as the content of the exhibition. What this approach ends up doing is providing an outlet for not only the artist to exhibit work — maybe it’s a piece that they have already created or it’s a piece that responds to the space — but exhibiting concepts the artists are already working with and putting it in a space that anyone can walk into or by and say, “oh this relates to me because I’m interested in this idea as well”. J: So where are you now, three years later? L: BLOCK is now moving into public space. It now has two different spaces — the alternative spaces with full-on rotating exhibitions and now the public space, and that’s where Kari’s coming in as an artist who also incorporates public spaces in her practice. These exhibitions are free, public, 24/7 — I mean, there are no hours associated with when you can view the work. You are not walking into a well-lit cube between the hours of 10 AM and 6 PM; rather you are walking down the street or stumbling upon them by happenstance. 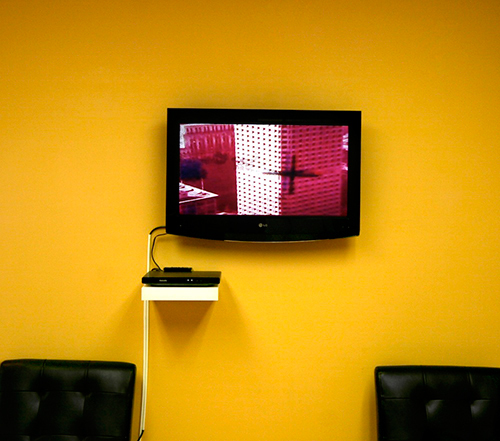 Documentation of previous BLOCK Gallery exhibition Compulsions with Jon Kuzmich, Carling McManus, and Kari Marboe. Pictured: Carling McManus, A Realistic Fear, 2010. Edited found footage, 16 mm film. J: How did you meet Kari? How did you guys hook up? L: She actually reached out because she saw what BLOCK was doing. She was interested in the program that BLOCK was building and said, “hey, here’s my work, maybe we can pull together some projects”. I looked at her portfolio and it was exactly what I was looking for — she works site-specifically, in the public sphere, but she also draws on what’s happening in that space. Since our first meeting she has been fully involved in the entire process. J: So Kari, how did you get to know of the BLOCK sort of “thing” that was happening? 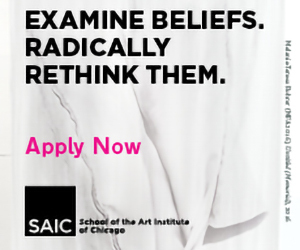 Kari: I first heard about BLOCK while I was just finishing up my MFA over at UC Berkeley. I had been creating site-specific text-based installations during my time there. Kari Marboe, Panel #1, 2012. Screen print on vinyl. 48 inch x 48 inch. Panel #1 outside the Berkeley Art Museum. K: Artworks designed conceptually and physically for a particular space, and in my case made with text. For example, during our thesis exhibition I worked with Dena Beard to find a public and easily accessible spot outside of the Berkeley Art Museum to place a piece. She suggested taking over one of the panels outside of the museum on Bancroft which is normally used for internal advertising on upcoming exhibitions or events and found a 4’x4′ panel that was available during the time we needed. 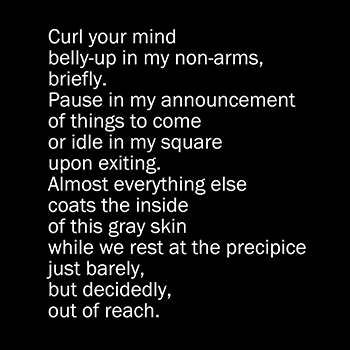 So I wrote a piece that talked about being exactly in that space, the motions of coming in and out of the museum, in poem form so people could sit down on one of the benches across from the work and enjoy it for a while. The label for the work was displayed right as you were walking out of the museum, so people were stopping and asking, “where is this piece of art, it’s not the Calder, where is it”. Another piece I worked for that show was with the East Bay Express. Kari Marboe and Erin Johnson, Newspaper Space #1, 2012. Newspaper and text. 2 inch x 5 inch. K: Yep, the free newspaper that comes out weekly. They were so kind and donated rectangular advertising space to me for seven consecutive weeks. My collaborator Erin Johnson jumped on board and we made a series of seven squares that spoke about the nature and functions of a newspaper. That was a fun project, especially since it was free and available to everyone. While I was working on that, I also spent a lot of time online, seeing what other people were doing with sites and where my text work could fit in. I somehow ran into BLOCK Gallery and it was exactly the type of thing I was looking for. I had never heard of a site-specific gallery before, or at least not one in the area, and was immediately interested in meeting the person behind it. J: What was that advertising or marketing for BLOCK? L: Gosh, at that point, it was very minimal. It started by hooking up with Oakland event calendars and bare-bone sites to say, “hey, I’m a program in Oakland and this is what I do”. It hasn’t been easy to put words to this type of program, instead I had to just do it, letting the installation images and the curatorial statements piece it all together. J: So Kari, take me through that process of contacting Lacey. K: After looking at BLOCK’s website I decided to send her an email with some links to my work. We got together and brainstormed on the types of sites that would be exciting to work with. While looking around in downtown Oakland we stumbled across Latham Square just before the City of Oakland and ReBar started their Pilot Project there. L: In our first meeting, I mentioned wanting to do something in that little triangle where Broadway and Telegraph spilt — we didn’t know it had a name then. After seeing the Pilot Project and realizing that it did not involve any artwork — other than the street paintings — we started thinking about how to get in touch with the City, ReBar, what the logistics of doing a work there might be, what would a project there look like, and how could we help add to this newly pedestrian space. J: So what is Latham Square? 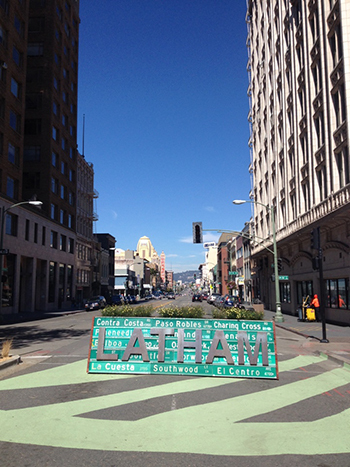 Are the Lathams an Oakland-based family? K: I’m glad you asked. L: Yes, here it comes! K: When we thought we might be interested in doing the project here I went to the Oakland History Room of the Oakland Public Library — wait, have you ever been in that room? K: Oh my goodness, it’s worth a visit! They have a specific room and librarian for all-things-Oakland on the second floor. The first librarian I met was already familiar with the Lathams and instantly pulled the files of James, the father, and Edith, the daughter. J: So interesting! I just got the chills. K: I know! They also have a database with scanned articles from the Oakland Tribune. I was able to search around and found an amazing article from April 10, 1913, that described a great deal about the fountain and the dedication ceremony. I mean everything from the color of the granite to Mr. Latham’s first job. 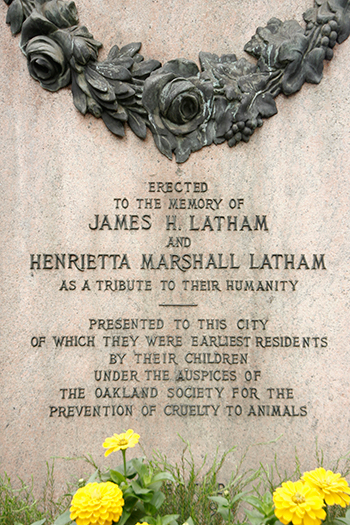 The title of this piece – Latham Memorial Fountain Unveiled – is the same as the article’s title. Kari continues to share the fabulous history of the Lathams. It is so fabulous that it has become the driving concept behind her installation. Text here would do no justice, and rather, a visit to the work of art would be most appropriate. K: What I’m interested in is taking this history and creating a piece that combines that story — specifically the desires of motives of the Latham children for building the fountain — with themes of how the memories of citizens are preserved within city structures over time. It’s been just over a hundred years since the fountain was installed. L: And at a certain point this piece will become part of Latham Square’s history as well. J: Can you talk about some of the logistics of the piece? K: Oh, boy. Site-specific pieces are about eighty-percent logistics and twenty-percent art making. L: It’s been email after email, meeting after meeting. It’s an ongoing evolution. You don’t want to start on finalizing the actual artwork because so much can change. J: Any details of those emails or meetings? K: Well, we knew we had to talk to the Downtown Oakland Association. L: The Downtown Oakland Association oversees a lot of different departments. Their main mission focuses on getting Oakland to be a more livable, more beautiful, more active, safer city. For example, they do the hanging plants on the lights, they have solar integrated trash compactors — great solution to any city’s trash management. K: They have a certain amount of funding allocated for projects like ours. For instance, they helped Art Murmur get off the ground and have been sponsoring the Great Wall where large-scale video projections happen. L: What’s fascinating about Oakland is that there is so much energy around the city’s re-identification through art, to position it as an exciting and relevant cultural hub. The crowds that turned out in the early days for the Art Murmur activated Oakland in a certain way, and now that First Friday has hit a plateau, I think there’s a lot of room for growth at this point. There is a ballooning need to gather around art again. The highlighted blue panels are the site of Latham Memorial Fountain Unveiled. J: What’s BLOCK’s position in the Oakland art scene? L: BLOCK is designed to be fluid on every aspect. When you’re not tied to a space, you’re not worried about the on-going programming of that one space. Being able to break away from that idea and bring art to a community or to places that people will frequent, and being able to use art as a sort of bridge for a new experience. 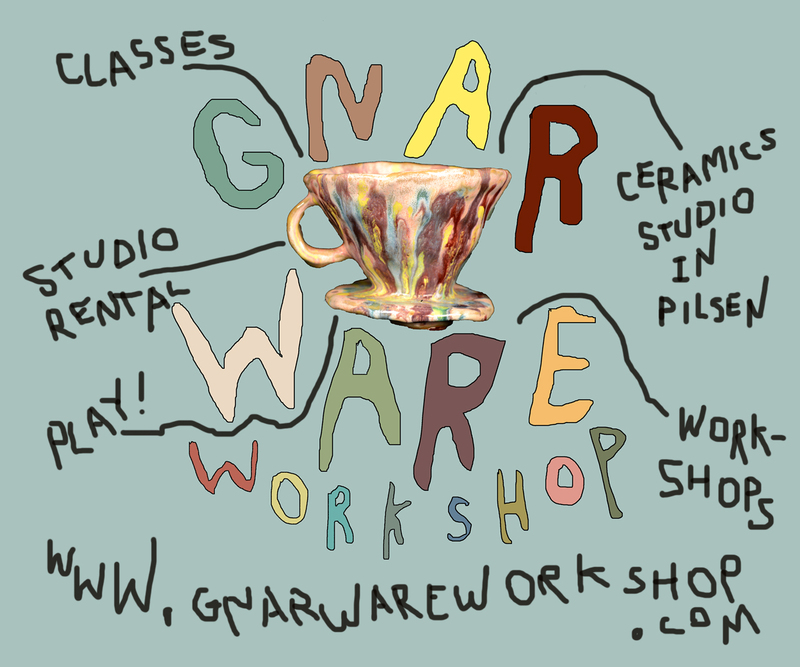 In essence, the program is about activating art, activating space to further the experience. So, why is BLOCK in Oakland? That’s a fascinating question. There’s something here, there’s an energy here that San Francisco has, but it translates in a very different way. Oakland is primed for growth, has a sense of opportunity. The people we’ve come in contact with here have an authentic, raw enthusiasm for it. I haven’ seen that in any other space or city.